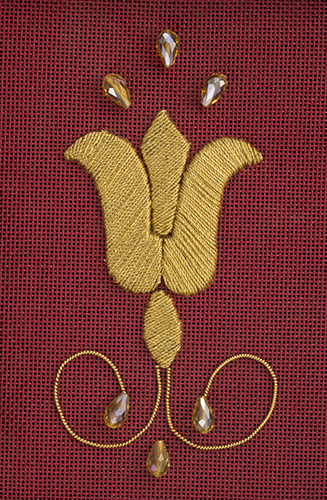 Zlatý Tulipán (Golden Tulip) by Inez Giles, completed as part of the requirements for Honors certification. In a conversation with Sumru Krody, Senior Curator at The George Washington University Museum and The Textile Museum in Washington, DC., I learned the technique of couching gold threads over a cardboard template was an Ottoman technique called dival embroidery in Turkish. But once again, instructions or even general information about the process is not readily available. What cardboard thickness is optimum? What is the most appropriate technique to use to attach the cardboard template? Is there a suggested method for cutting out the template? With no instructions available, I had to use the trial and error method. My initial motif was that of a stylized pomegranate. Pomegranates are a Turkish motif and used in embroidery across Slovakia. I was dismayed when the template began to disintegrate as I worked on the project in a Hand & Lock class I enrolled in. What did the early embroiderers know that I didn’t? As I developed my ideas and refined my technique I developed a deep appreciation for the design process. Through trial and error and many false starts, I finally discovered an appropriate cardboard thickness and a design that would support the gold thread. Gold threads over felt padding always nestle so snugly. Cardboard is not as welcoming and accommodating and as a result, I had to develop a deft touch in using an emery board to finely bevel the edges of the template. This allowed the gold thread to rest more comfortably on the cardboard. In fits and starts the piece began to take shape. The tulip is another Ottoman motif and also one found throughout Eastern Europe. The Ottomans occupied Central and Eastern European lands for hundreds of years until they were driven back at the Battle of Vienna (1683). It is no surprise the Ottoman motifs and techniques were quickly assimilated by the native people.